Even though AMC made a name for itself with dramas like Mad Men and Breaking Bad, horror and fantasy programming, like The Walking Dead franchise and Into the Badlands, have been big Nielsen race winners for the cable network. Now they have introduced The Terror TV show. Based on the Dan Simmons novel of the same name, although this period drama is rooted in historical events, it has something of a supernatural twist. How will it go over with the TV audience? Will The Terror be cancelled or renewed for season two on AMC? Stay tuned. **Status update below. An AMC anthology drama, based on the Dan Simmons novel of the same name, and inspired by a true story, The Terror stars Jared Harris, Tobias Menzies, Ciarán Hinds, Paul Ready, Adam Nagaitis, Nive Nielsen, Ian Hart, and Trystan Gravelle. The first season centers on the Royal Navy’s perilous quest to find the Northwest Passage. Despite heightened fears, fading hopes, and scarce supplies, they forge on until a supernatural threat endangers them all. Through the course of this ordeal, The Terror explores everything that can go wrong, when desperate men struggle with their environment and one another. What do you think? Do you like The Terror TV series? Should it be cancelled or renewed for a second season on AMC? **6/22/2018 Status Update: The Terror has been renewed for season two on AMC. Details here. It’s sad to see that in order to succeed and make people keep watching the shows must go all in on first episodes and explain everything before short attention span users decide to abandon the show. 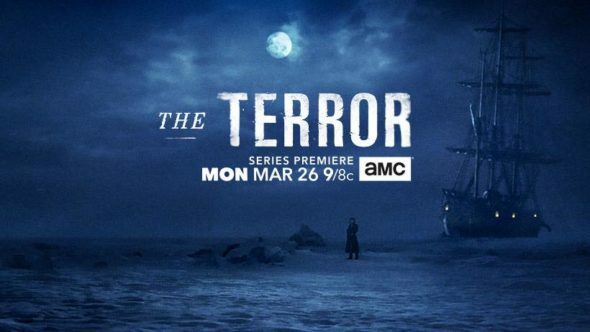 While amazing shows like The Terror that can start with a boom but slowly to develop until the last episode, are doomed to low ratings and eventual cancellation. Because people just can’t understand that they need patience to keep watching. Hope there will be season 2, there are so many stories of lost people that can be told.